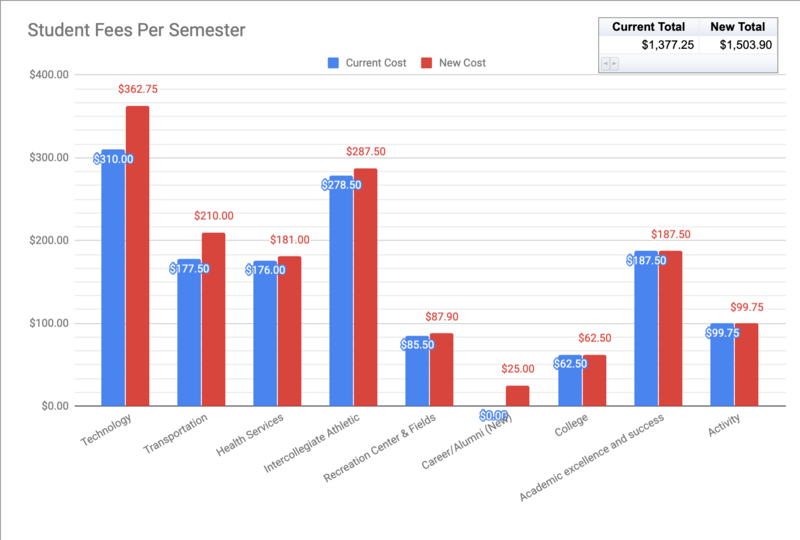 A chart on specific student fees per semester. The university is proposing to raise fees from $1,377.25 a semester to $1,503.90 in total. Students could see their fees increase for the 2019-2020 school year. At an Undergraduate Student Government (USG) Senate meeting on Thursday, March 14, Dean of Students, Richard Gatteau, said the university is proposing to raise fees from $1,377.25 a semester to $1,503.90. A new fee called the Lifetime Career & Alumni Fee was proposed by all four SUNY centers — Albany, Binghamton, Buffalo and Stony Brook — to enhance university career services. Tuition will also be going up $200 per academic year at all SUNY campuses in the fall. The proposed increase in the Transportation Fee would be used to purchase three new buses, Gatteau said at the meeting. He said that some of the older ones are running past their life span, and it would be more efficient to buy new buses than to maintain the current ones. The school also plans to purchase a new transit app with better real-time tracking. Between 45 and 50 graduate students protested fee costs on Wednesday, March 13 with a sit-in inside the Administration Building. Propersi-Grossman argued that graduate students pay more in fees than they sometimes get paid. She said that GSEU collected petition signatures and conducted a fee survey in the fall of this academic year to gather data about opposition to the fees graduate student workers pay. Steven Ketchum, chief steward of the Research Assistant (RA) union, said that graduate students gain little benefit from the university’s fees in the first place. Their technology needs are mainly covered by their principal investigators’ grants, and they mainly use off-campus health services through their employee health insurance plans. “At this point, it’s hard to see what we are even paying for or why we should pay them at all,” Ketchum said. GSEU is encouraging students to join their “F#*K the Fees” Committee to protest the increase in costs. Gatteau said at Thursday’s meeting that there will be a student media event about the fees on Wednesday, March 27. Correction, 3/26/19 5:49: In a previous version of this article, Caroline Propersi-Grossman’s last name was spelled Propersi.